As you know, we're still working over here at ISI but updates have been slow. With the season slowly ramping up we're hoping to have more time available to stop patching in updates! Currently, I can't make any promises as to when those are going to be, but I'm aiming for at least once a week updates! This WILL get moving again! 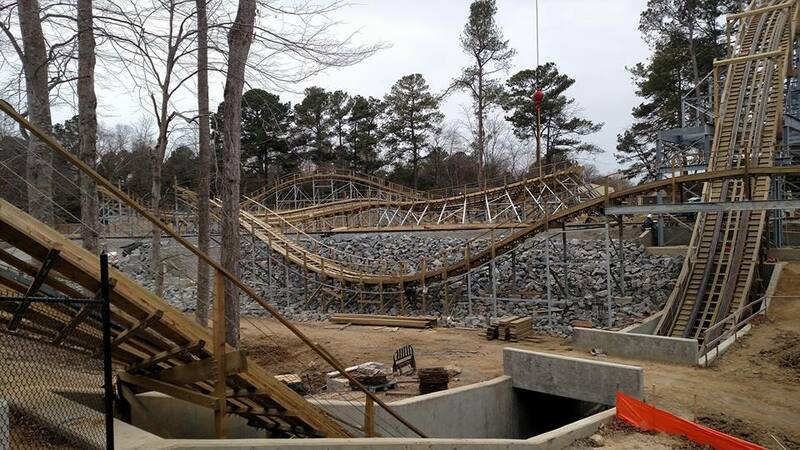 Now, As you may know- Busch Gardens Williamsburg has their first wooden roller coaster under construction. InvadR is set to open this season at the park and over the last week or two I've been scrounging for updates, images and information about the ride. Recently, Busch Gardens Willimsburg has posted up this image, giving us a nice look at the two trains going onto the coaster. Frankly, I think they look amazing! The perfect fit and detail we've come to know and love from such a detail-oriented park! 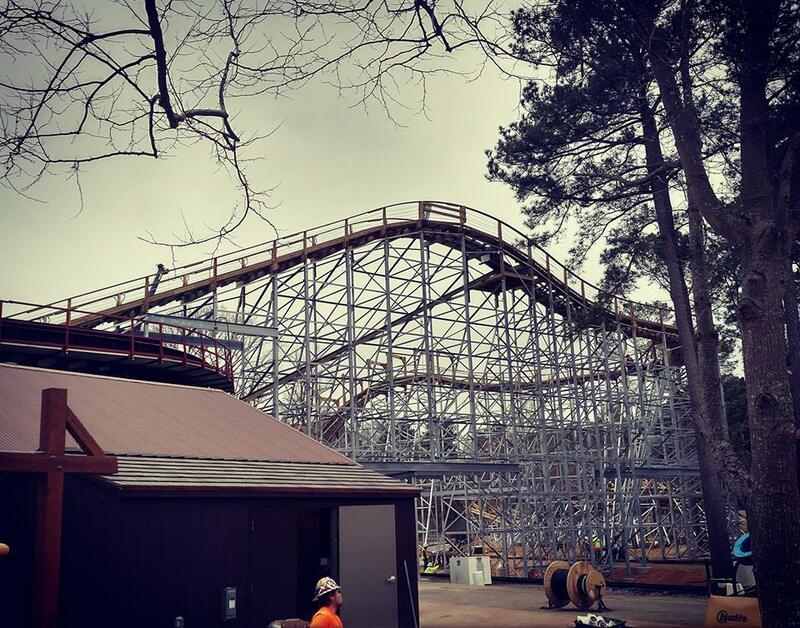 Also online lately, a few amazing photos from the awesome folks over at Attraction Chasers, who got in for a hardhat tour of the new ride! Can you tell I'm jealous yet? Because I am. I so very am! You lucky people! Now I've got several images from them so let's post the link to their main site! Image from Attraction Chasers, Those lucky Bastards! Honestly, this ride looks like it's going to be simply fun. From these construction photos we can easily guess this newest addition is going to be well themed, fitting into the area of New France. I did have a few doubts from the layout and blueprints that they'd be able to get a good coaster into this area. Well, this will teach me to stop having doubts! 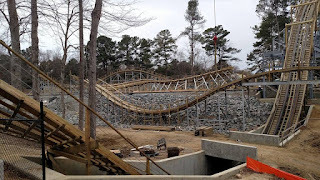 Finally, we get a look at the lift hill for InvadR. 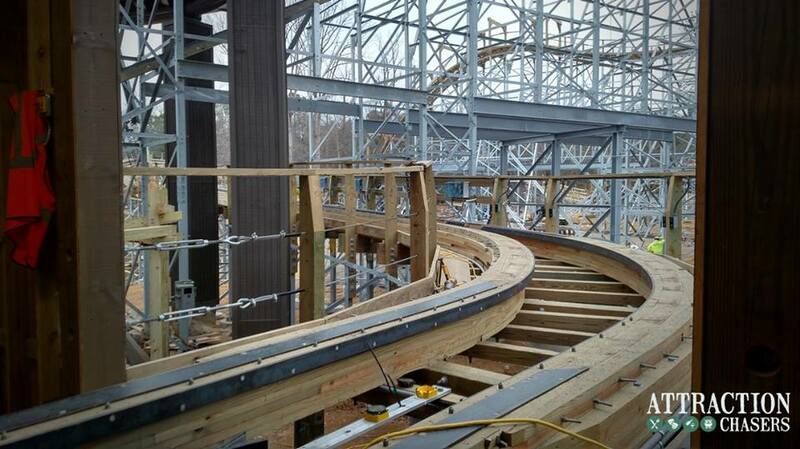 Still not much news about the ride building or anything else involved with the coaster but from these photos, we can see things are well on the way for the opening! "In 2017, a great battle will ensue in the trappers' village of New France. Vikings will invade, forcing the trappers to defend their village. 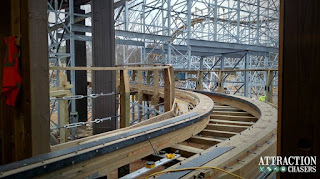 Invade new territory on the first wooden coaster at Busch Gardens ® Williamsburg. The 74-foot drop makes it a force to be feared and nine airtime hills wait to be conquered by bold warriors. Chart a course through the winding frontier at 48 mph and claim eternal glory for your crew." That is all for now. We hope to bring you more news soon. And again, make sure you thank those lucky folks at Attraction Chasers for the images!